This article is about the character from Fire Emblem. For the dog in The Super Mario Bros. Super Show!, see Ike (The Super Mario Bros. Super Show!). Ike is the protagonist in two games of the Fire Emblem series, debuting in Fire Emblem: Path of Radiance, the series' ninth installment. In his home series, Ike is the leader of the Greil Mercenaries, who are drawn into two wars spanning the continent of Tellius. With the help of his companions, Ike acquires the sacred sword Ragnell and brings peace to Tellius, ending hostilities between its inhabitant "beorc" and "laguz" races in the process. He appears as a playable fighter in the Nintendo-crossover fighting game, Super Smash Bros. Brawl, and returned for its successors, Super Smash Bros. for Nintendo 3DS / Wii U and Super Smash Bros. Ultimate. Ike is the third Fire Emblem character to appear in the Super Smash Bros. series, after Marth and Roy. Ike is a very powerful fighter - one of the strongest, but as a downside, he is quite heavy and slow. Ike appears on the stage via warp magic. 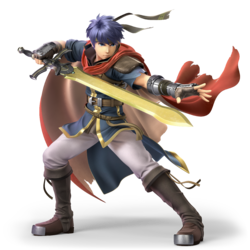 Ike appears as a playable character in Super Smash Bros. Brawl, using his appearance in Fire Emblem: Path of Radiance. He fights using the two-handed longsword Ragnell, which gives his attacks power and range, but as a result he is slower and heavier than most characters. Ike was not originally intended to be in the game from the start; instead, Masahiro Sakurai had created a template for a slow but powerful swordsman. As he also wanted to include a new Fire Emblem character, it was decided that Ike, in addition to being the protagonist of the latest games in the Fire Emblem series at the time, would be a good fit for the concept. Ike is voiced by Jason Adkins in English, and by Michihiko Hagi in Japanese, his respective voice actors since the release of Fire Emblem: Path of Radiance. This also makes him the first Fire Emblem character in the series to be given an English voice actor. Ike's neutral special move is Eruption, in which he plunges his sword into the ground to create an explosion. His side special move is Quick Draw, which has Ike charge a sword slash that sends him directly forward. 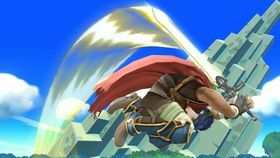 His up special is Aether, in which Ike throws his sword into the air and slams back into the ground. His down special move is Counter, which has Ike deal a counterattack if he is hit. His Final Smash is Great Aether, which has him slash any nearby opponents into the air, where he repeatedly attacks them before slamming them back into the ground. Ike makes his debut in the Subspace Emissary near the end of The Battlefield Fortress. During the story, both Marth and Meta Knight fail to stop the Ancient Minister from carrying another Subspace Bomb to another location in the trophy world. Hope seems lost for the two, until, out of nowhere, the Ragnell sword begins hovering behind the Ancient Minister, and Ike continues to use Aether on the Subspace Bomb, breaking it and deactivating it, making the Ancient Minister flee. The three warriors continue through the wasteland, finally reaching the Ancient Minister, but are unable to do anything as he floated over a cliff. The three continue to dash onwards through The Wilds, after seeing Galleom in its tank form. Galleom transforms into its main form after meeting the swordsmen. Ike, Marth, and Meta Knight face off against Galleom afterwords, and then continue into The Canyon. After Meta Knight had left the group after Galleom was defeated a second time, Ike, alongside Pokémon Trainer, Lucas, and Marth, are seen fighting many Primids, now with the Ice Climbers. The five "warriors" are then seen (Mario, Pit, Kirby, Link, and Yoshi) in the background, jumping off from a bluff to help fight off the army. 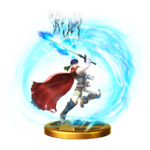 After awhile, Ike, alongside many others, are flown into Subspace, where he and all others are turned into trophies. However, King Dedede, Ness, and Luigi recover him, and others (Kirby also helps afterwards). He and the others are then pitted against The Great Maze, and then the creature whom turned the heroes into trophies, Tabuu. Ike returns as a veteran fighter in Super Smash Bros. for Nintendo 3DS and Super Smash Bros. for Wii U. His design has been changed to be his appearance as a Hero in Fire Emblem: Radiant Dawn. 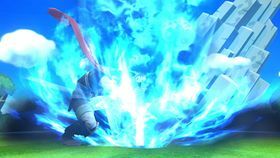 While Ike's moveset is no different from the previous game, most of his attacks that use fire use blue flames rather than the red seen in Super Smash Bros. Brawl, referencing his blessing by the goddess Yune at the end of Fire Emblem: Radiant Dawn, during which his sword is cloaked in blue fire. Ike receives faster movement and attack speed, in exchange for his overall damage output being slightly toned down. Ike reappears in Super Smash Bros. Ultimate as a playable character, where this time, players can choose to play as his Fire Emblem: Path of Radiance or Fire Emblem: Radiant Dawn appearance. His voice also changes slightly depending on which appearance is used, which is provided by his voice actor from Fire Emblem Heroes, Greg Chun, replacing Jason Adkins from previous Super Smash Bros. installments. Ike benefits greatly from universal changes: his mobility is even faster, his short hop timing is greatly reduced, his aerials have less landing lag, his recovery is extended by the reintroduction of directional air dodges, and his offensive play is aided by the abilites to use any ground attack out of a run and use his aerials on ladders. Ike's Classic Mode route involves fighting characters in dark-colored alternate costumes (except if they are dark-colored by default). This represents his relationship with the Black Knight in his own games. Eruption is Ike's standard special move. 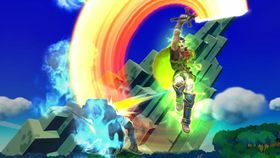 Ike holds his sword in the air before plunging it into the ground, creating an explosion that damages any nearby opponents. 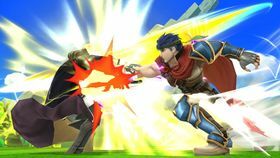 The move can be charged by holding the special move button, and automatically strikes once fully charged, though a fully charged Eruption deals 10% damage to Ike. In Super Smash Bros. Brawl, the flames the attack makes are red; the fire is changed to being blue in Super Smash Bros. for Nintendo 3DS / Wii U and Super Smash Bros. Ultimate. While the attack can be powerful when it is being charged, a full power Eruption actually delivers less knockback than some of the weaker stages of the charging process. In fact, the stage that comes before Eruption reaches full power can potentially one-hit-KO most fighters. On a side note, the full power Eruption delivers horizontal knockback, while all the other charging stages deliver vertical knockback. Additionally, Ike begins flashing red when Eruption is almost at full power. In Super Smash Bros. for Nintendo 3DS / Wii U, Eruption has two custom variants: the first is Tempest, which cannot be charged as long and replaces the fire with wind that pushes opponents away; only the sword can deal damage, and a fully-charged Tempest does not damage Ike. When used in the air, the move does stall Ike's falling speed for a moment, which can help with his recovery. The second variant, Furious Eruption, creates larger explosions that deal more damage to both opponents and Ike; the move can also damage Ike before it's fully charged. Quick Draw is Ike's side special move. 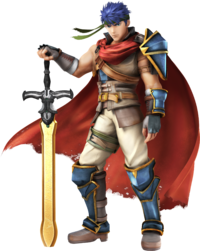 Ike dashes forward a distance depending on how long the move is charged and slashes his sword, damaging any opponents in his path. Although the move can only be charged a certain amount, Ike can be kept in place as long as the special move button is held down. The dash also stops when Ike reaches an edge or strikes an opponent. When used in midair, Ike is left helpless afterwards, though in Super Smash Bros. for Nintendo 3DS / Wii U, there is a brief window in which Ike can act before being helpless. The first custom variant given to Quick Draw in Super Smash Bros. for Nintendo 3DS / Wii U is Close Combat, which dashes faster and passes through opponents to strike them directly up for less damage. The second is Unyielding Blade, which gives Ike super armor throughout the attack, preventing him from being stopped, as well as dealing greater damage, but Ike does not travel as far, or as quickly. Aether is Ike's up special move, based upon the skill obtainable in the Fire Emblem series. 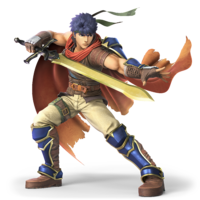 When used, Ike throws his sword up into the air, damaging any nearby enemies, and knocking them into the air, then jumps up, flips, and slams back toward the ground. Ike also gains super armor while throwing his sword, but it only lasts until he jumps, and can be interrupted if Ike gets grabbed. The move offers very little horizontal distance, which can be a hindrance to Ike if he's not below a ledge. 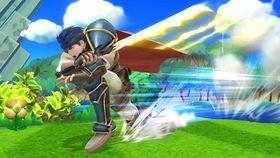 In Super Smash Bros. for Nintendo 3DS / Wii U, Aether's first custom variant is Aether Drive, where Ike throws his sword diagonally into the air, and slams back down. The move offers better horizontal distance, which helps Ike's recovery, but at the same time, the move's vertical distance is shorter than that of the default Aether. The second variant is Aether Wave, which creates a shockwave when landing that extends the range of the attack, but does not deal as much damage. Counter is the down special move used by Ike as well as Marth, Roy and Lucina. The move is based on the combat of the Fire Emblem series; when one unit attacks another unit, the opposing unit counterattacks afterwards. When used, Ike enters a readied stance and automatically counterattacks whenever attacked, reflecting all damage and knockback back onto the opponent. Ike's Counter has greater range and deals greater damage than Marth's Counter, inflicting 1.2 times the damage of the opponent's attack, but like Roy's is slower. In Super Smash Bros. for Nintendo 3DS / Wii U, the first custom variant for Ike's Counter is Paralyzing Counter (spelled Paralysing Counter in PAL regions), in which the attack stuns enemies rather than damaging them. His second variant is Smash Counter, which is slower but deals increased damage and knockback. Great Aether is a more powerful version of Aether and Ike's Final Smash. Similar to Aether, Ike swings his sword up, sending any nearby opponents into the air at the center of the stage (or above a nearby platform if the center of the stage is a pit or other obstacle). He then slashes them multiple times before slamming them back down to the ground, which causes a large explosion, knocking them back up into the air. If the first swing doesn't connect with an opponent, the Final Smash will not play out. Ike appears as a Mystery Mushroom costume in Super Mario Maker, using the same sound effects from Fire Emblem: Shadow Dragon and the Blade of Light as the other Fire Emblem character costumes. Ike A member of Crimea's top fighting force, the Greil Mercenaries. He's a man of few words whose blunt manner gives the impression that he's uncaring, but he's actually a passionate hero. He was crucial to the reconstruction of Crimea. In Radiant Dawn, he continues to show his deep sense of honor and leads the Greil Mercenaries to the aid of the Laguz Alliance. Great Aether Ike's Final Smash--a powered-up version of his signature move, Aether. Ike faces a foe and swings his sword up for a hit, then tosses his sword into the air, performs multiple nasty strikes, and finally unleashes a mighty overhand blow to send his opponent plummeting down. It's a very impressive sight, but if Ike misses with the first upward swing, he can't use the move. Wii Fire Emblem: Radiant Dawn (11/2007) One of the main characters from the Fire Emblem series. Having fought in the Mad King's War, restored the fallen nation of Crimea, and taken on the Begnion Empire, Ike is rightly called a hero. He has the strength to back the title—one good swing of his blade can launch the heaviest of foes. One of the main characters from the Fire Emblem series. Having fought in the Mad King's War, played a huge part in restoring the fallen nation of Crimea, and taken on the Begnion Emprire, Ike is rightly called a hero. And he has the strength to go with that title. One good swing of his blade can launch even the heaviest of fighters. Wii Fire Emblem: Radiant Dawn (11/2007) Ike's side smash is a powerful two-handed sword strike. It's one of the best launch attacks in the entire game, though it will leave you wide open when you use it. For Eruption, one of his specials, you stab the ground and unleash a pillar of fire. Charging for too long will hurt Ike, so be careful! Ike's side smash is a powerful two-handed sword strike. It's one of the best launch attacks in the entire game, so even though it leaves you open, it's a real winner. For Eruption, one of his specials, you stab the ground and unleash a pillar of fire that hits anyone nearby. If you charge it too long, though, you'll hurt yourself, so be careful! N/A Ike's Aether up special is combined with a relentless barrage of sword blows in this powerful Final Smash. He knocks targets into the air with an upward swing, and then they're stuck there as he strikes over and over. Finally, he slams them down to the ground and launches them. Just make sure that first strike hits! Ike's Aether up special is combined with a relentless barrage of sword blows in this powerful Final Smash. He knocks his target into the air with an upward swing, and then they're stuck there as he strikes again and again. Finally, he slams them down to the ground and launches them. Just make sure that first strike hits! Pit: Does Ike look a little different to you? Maybe a little...tougher? Pit: His clothes look different, and his sword looks even more menacing. Palutena: Yes, I suppose you're right. Pit: And he definitely hasn't aged well. Palutena: Well, compared to gods and angels like us, Ike is just a baby. Viridi: I don't know how old you are, Pit, but you don't look like you've grown at all. Pit: Oh, like you're one to talk! How old are you, anyway? Ten? Viridi: A goddess never reveals her age, Pit. Palutena: Break it up, you two. Back to Ike. He has a powerful side smash that he will send you flying, but that's also his weakness. Viridi: He's very vulnerable at that time, so dodge it and strike back! Pit: I claim this victory in the name of Skyworld! SKYWORLD! SKYWORLD! Viridi: YEAH! SKYWORLD! SKYWORLD! SKYWORLD! Viridi: There are two versions of Ike. The Path of Radiance version and the Radiant Dawn version. Viridi: He's basically either a mercenary or a hero. Palutena: The two versions of Ike may look and sound a bit different, but his strength doesn't change at all. Viridi: But one of them is three years older than the other. Shouldn't the older one be stronger? Palutena: Yeah, you'd think the older one would have three more years of training under his belt. Pit: Maybe he skipped three years of arm days. Palutena: I somehow doubt that. Have you seen the way he swings that sword? One blow from that sword can do more damage than two of yours, Pit. Be careful. One of the main characters from the Fire Emblem series. Having fought in the Mad King's War, restored the fallen nation of Crimea, and taken on the Begnion Empire, Ike is rightly called a hero. He has the strength to back the title – his powerful blade makes him a match for any foe. When Ike uses Aether to attack the Ancient Minister, he shouts "Great Aether." If Ike grabs someone while he is a giant and does a pummel, the grabbed opponent instantly breaks free from the grab, regardless of their damage. This also happens if Ike grabs someone while tiny. Ike's crowd cheer in the Super Smash Bros. series, "We like Ike," is a reference to the campaign slogan used by U.S. President Dwight D. Eisenhower "I like Ike." This page was last edited on April 6, 2019, at 20:24.